Jasper in the winter time is as spectacular as the summer months. Although Jasper is a little further from Calgary International Airport than some of the other nearby resorts, it is worth the extra travel time as it is a lot quieter over the winter months. The tours opposite compliment the excellent skiing and snowboarding available at the Jasper Marmot Basin Ski Resort and most are perfect for a "rest day". If you are not wanting a "rest day", there are also tours for the active and adventurous such as Jasper Heli-Skiing and Heli-Boarding as well as Jasper Heli-Snowshoeing. Click on the links opposite for more information or check out some of our advice on Jasper winter tours below. The helicopter tours do require minimum numbers so try and get a group together to guarantee the departure. The Jasper Ice Walk Tour gives you a unique view from inside the Maligne Canyon due to the frozen ice. The inside of the canyon is not accessible in the summer due to the water flowing through it. 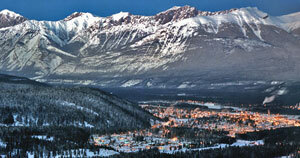 The Jasper to Banff Sightseeing Tour takes you through some spectacular scenery. You will travel along the Icefields Parkway which is a breathtaking highway to Lake Louise from Jasper. Jasper Snowmobile Tours are a fun way to see some beautiful backcountry near Jasper. These snowmobiles, or "skidoos", are easy to drive with a finger trigger for acceleration and heated handlebars for your comfort. Wildlife is still about in the winter time and the Jasper Wildlife Sightseeing Tour is ideal for spotting. These guides know exactly where to find the wildlife and provide an interesting commentary. Do you like to shop? Then the West Edmonton Mall Shopping trip is for you. The West Edmonton Mall is the largest shopping and entertainment complex in the world and there is plenty to keep any family entertained for the day! If the Banff winter tour you are interested in is not listed above, please contact us and we will do our best to help.